Haberlea is a monotypic genus of flowering plants in the family Gesneriaceae. 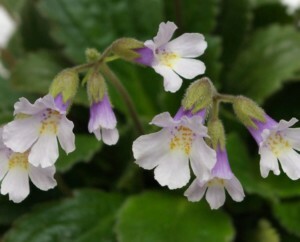 The only member of this genus, Haberlea rhodopensis, is endemic to several mountains in Bulgaria, especially the Rhodope mountains, and a small part of northern Greece. Common names include Orpheus flower and resurrection plant because of the remarkable ability of Haberlea to survive very long periods of desiccation. The species is a stemless, evergreen perennial found in north-facing, rocky habitats. Basal rosettes of dark green leaves bear trumpet-shaped flowers in shades of white, violet or purple in spring and summer. Despite the zygomorphic nectar-producing flowers (which are considered an ancestral character) and the overall trend in Gesneriaceae, the resurrection plant is only rarely pollinated by bees and does not have specific pollinators. Rather, its evolution has switched in the direction of providing pollen as a reward and generalisation of pollinating insects – a trend that is observed in the other two European members (Jancaea and Ramonda) of the more tropically and subtropically spread family Gesneriaceae. Active pollinators of Haberlea are found to be syrphids and Lasioglossum morio, which are characterised by low preferential behaviour regarding the plants that they visit for food. Haberlea rhodopensis (pale lilac flowers) has gained the Royal Horticultural Society’s Award of Garden Merit.